This is an advertisement for Clarke's night lights. In the 19th century it was very unusual to have electricity in the home, most homes were lit by gas lamps and fires. But fires took a long time to build, needed constant attention, created smoke and dirty grates and so fire were not lit in houses at night. Instead nightlights were advocated. 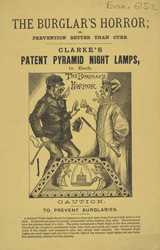 These however were also dangerous so products advocating safety, like Clarke’s pyramid night lamps, were very popular.